This is our son Jacob and our fight to save his life from a rare brain disease called ALD or Adrenoleukodystrophy. Here is the team at the Chiropractic college: Sam, Romaine, Roman, Johan, Brita. The amazing interns who are helping Jake, from chiropractic treatments to exercise rehab! 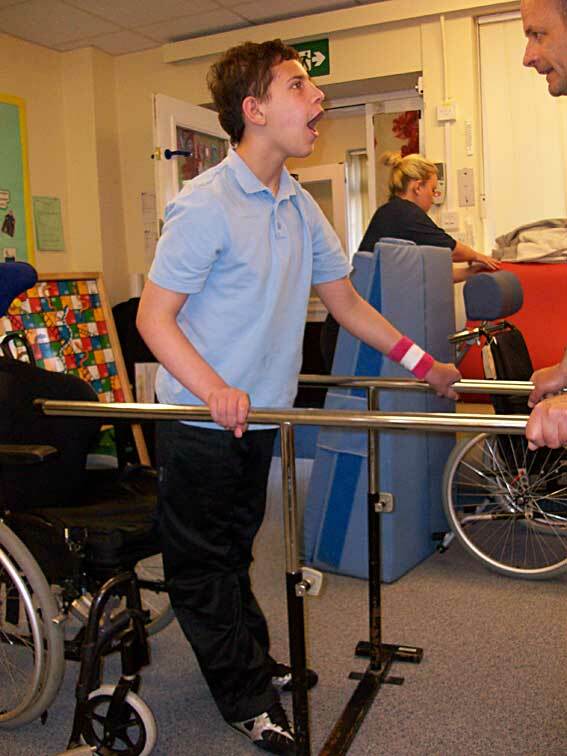 they have produced a specific programme for Jake to follow, using different techniques for different muscle groups, to improve his muscle tone, circulation and movements. 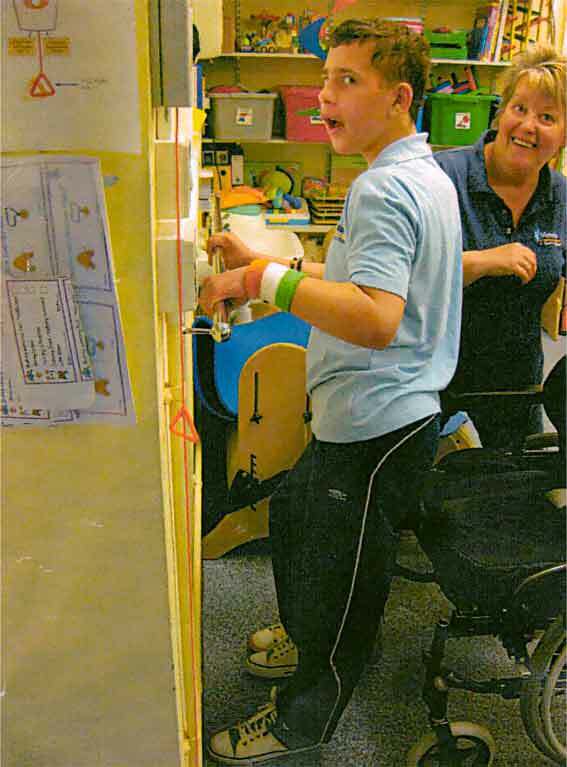 This is Rhiannon Jacob's Occupational Therapist. Rhiannon while being Jacob's OT also does house calls!!! and bought over a special splint she had made for Jacob's right hand. Although the clawing is no way near as bad as it was, his hand does tend to claw if he isn't thinking about it... so Rhiannon had a special splint made to help! Amazing or what! She has helped me with so much stuff to do with the disablilty world and is always on hand when I need her. Like all of the staff! If Victoria school see a problem they go to work to finding a solution to help! like I say under the school bit, this school is truly amazing! 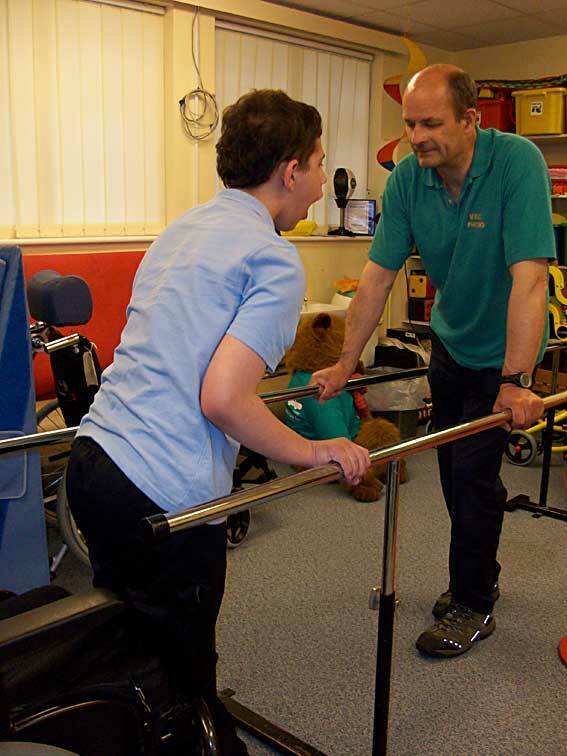 Here is Jacob with his physio Andre at Victoria school learning to walk again with the parallel bars. The only way I can explain it... in English is... they performed a Lumbar Puncture on Jacob very low risk and really it was just like an injection!... they took his cells from his bone marrow in his hip on the Tues... a very safe and quick procedure... they call this the collection... half an hour later and we are off to finish the rest of the day! They did put Jacob out for this... and after half an hour of coming round he was fine and off we went. They then took his cells to the lab... and did what they do... almost like Star Trek... they modified the cells... and on the Thurs we went back for the Lumbar Puncture... this procedure was approx 1 hour... again put out and then we were in recovery for about 3 hours for them to monitor Jacob. Jacob was absolutely fine and woke up hungry and wanted to leave to go to where we were staying as they had a soft play area! amazing! nobody knew what to expect as Jacob was the FIRST CHILD IN THE WORLD!! to have this procedure done... A huge decision... but when faced with the disease ALD you do whatever it take to save your child's life... we did have a lot of communication with the Xcell Center who were great and extremely supportive. We obviously questioned everything and then took the leap. This website is a must for you to look at www.xcell-center.com it explains everything thoroughly and also has patient stories and reams of information about their procedures.. We have tried to explain it a simply as possible... but please visit the website for all the facts etc. You can always email us for more info on this and I have a great contact there that I can put you in touch with. We are due to go back In Aug this year (2010) for a stem cell assessment. All we can tell you at this stage is... we believe this is what Jacob needed and is showing signs now that it has been successful. We can't base it on anything as Jacob is the first to have this done... but we definitely made the right decision and would again! While at the Xcell center we met a lady called Sabine who with her husband runs a physiotherapy centre in Unna in Germany... about 40 mins from the Xcell center in Dusseldorf. 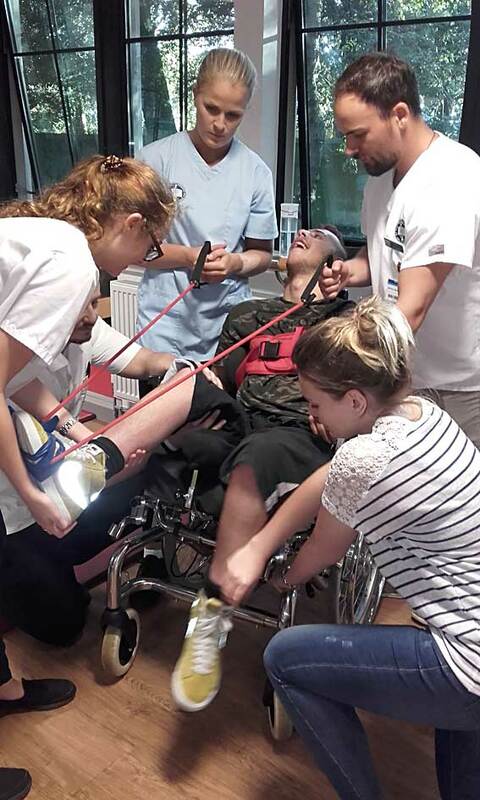 The Xcell center recommended that Jacob saw Sabine for physiotherapy..... BUT this is physiotherapy with a difference! We met Sabine who runs, with her husband and a crew of staff, a physiotherapy centre called the ISST. Sabine's husband is a doctor and their son was born with cerebal palsy... similiar symtoms to what Jacob has. She was amazing and explained to us in that hour so much more about the brain and how it works and what is happening to Jacob! She showed us how to use specialist equipment on Jacob - a special buzzing massager/rounded looking toothbrush and a face former. She showed us how to use it and how many times a day etc. The massager is crucial... when the stem cells go back in to the back the massager, which you buzz up the back, moves the stem cells up to the brain... the toothbrush stimulates the inside of the mouth and the face former does what it says! within 2 days of using these gadgets Jacobs face started to change... he was eating better and food wasn't getting stuck in the roof of the mouth... his tongue started to move... which it had stopped doing... so when food got stuck he couldn't use his tongue to get rid of it.... his lop-sided face started to sort itself out... back in Nov Jacob looked liked he had a stoke... the whole right side of his face was lop-sided... I had to liquidise/cut food up into tiny pieces... he couldn't chew properly and was dribbling most of the time. We started using these gadgets straight away... and today Jacob's face is practically back to normal and hardly dribbles at all... the face former not only helps the mouth and the muscles surrounding the mouth to get stronger but all the neck as well. Jacob has to sit with his feet flat on the floor... hands on his knees and have the perfect posture position... which was hard to start with as Jacob's body leaned to one side... his right side... Sabine suggested that Jacob needed intensive physio to help his whole body/walking/talking/posture/balance etc. So when we got home we researched her website www.isst-unna.de they, as a family when their son was born, realised that there was nothing really on the market to help all these symptoms and decided to invent these gadgets to help. So they now have this amazing place full of invented and made equipment to help such symptoms. 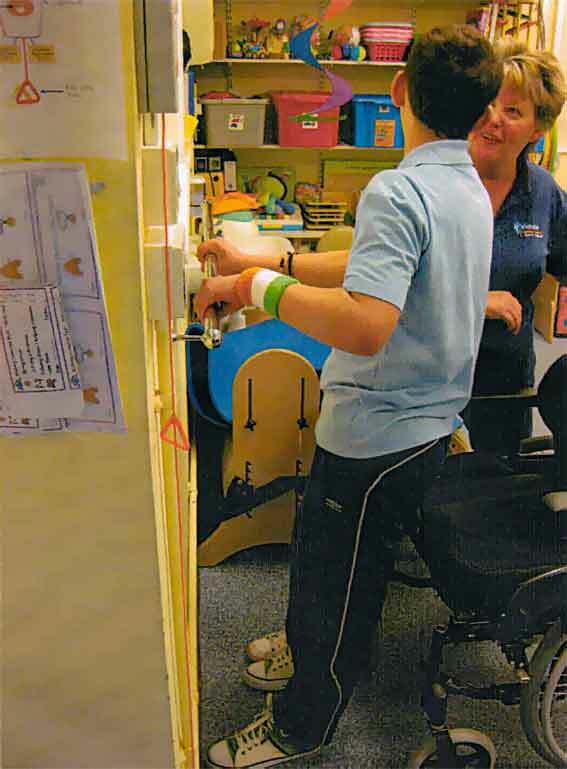 We went there in April this year (2010) and Jacob did a 6 day fully intensive physiotherapy programme. This was amazing... when they explained to us why it was so important it all made sense "if you have new cells going into the body you need to get them to the brain asap and then stimulate them into working" and that is exactly what they did. As you can see in the pictures Jacob had a lot of work to do with all the equipment... re-training him to walk again properly... getting his balance and co-ordination back again... etc etc... they also did computer work again to re-train his eyes and the brain... he had to lie on a waterbed for 45 mins everyday with special goggles that stimulate the brain while listening to classical music. Also combined with the mouth exercises and getting his tongue moving even more... they would put edible sugar paper in his mouth... stick it to his cheek/roof of the mouth etc and he had to find it with his tongue and when found eat it!! luckily he loved the taste and his tongue was moving all over the place. We could go on forever about these 2 places and what HOPE they have given us... and to physically see what it has done... we hope the pics can explain some of what they did. In our opinion the 2 go hand in hand... we are also going back to the ISST in Aug this year (2010) for more! Every day Jacob makes little improvements and it gives us HOPE that what we are doing is working! We have to continue the programme at home and keep up with the physio so the brain doesn't forget... we have a programme to follow and everyday we follow it... the school also helps us as most of it you need to do 3 times a day.... so we are all working together continuing to get Jacob better in more ways than one. For Jacob and his symptoms these 2 places have been everything and more that we hoped for... and we keep in close touch with them updating them on Jacob's progress and any questions we have... again if you want to know more, either visit their websites or email us or them... we are all here to help as much as we can... that is why we have produced this website... as without all the research we have done ourselves we wouldn't know all of this and we want to share this with as many people as possible going through the same traumatic time that we are... and we can tell you from our point of view one thing you need is hope! We hope that this will bring hope to you to.